Today the rock room is host to a historic and exceptional recording of a talented and sometimes turbulent group of musicians. On January 20th 1968 as they were approaching the end of their short lived run as rock pioneers, the Buffalo Springfield played the Whittier High School auditorium in Whittier California. An enterprising member of one of the opening acts that evening captured the majority of the Buffalo Springfield's performance. 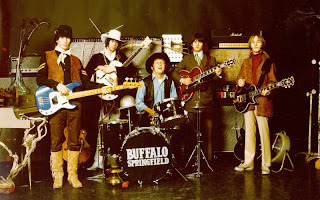 While the vocals are messy and somewhat obscured by the haze of tim, and the power of the Springfield's gear, the recording is one of only a few that exists of Buffalo Springfield in their prime. Neil Young's guitar is in its luminous and tremoloed glory, shimmering silvery notes like diffused sun rays through melting ice. The band's sound is vintage and tight, and the scattered and echoed applause of the high school gym gives the recording a vintage patina. By this time, bass player Jim Messina (of Poco fame) has taken over for founding member Bruce Palmer, but the original core of Stephen Stills, Neil Young, Richie Furay, and Dewey Martin remained. 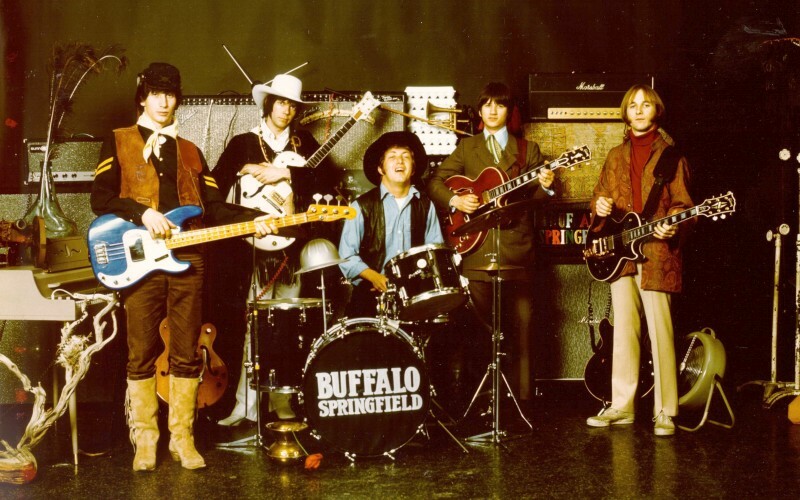 Neil would soon leave, Buffalo Springfield would divide spawning some of rock's greatest bands, but at this juncture they were still together, and changing the face of 1960's rock and roll. The show reportedly opened with "Rock and Roll Woman' but this is unfortunately not available on the field recording. The tape picks up with the jaunty Neil Young penned 'On the Way Home". At first the performance sounds like I am listening through a pair of ear muffs, but the fidelity improves once Stills slithers a snaky series of guitar lines across the framework of the song. Furay is in his full and glorious throat singing Young's lyrics with earnest emotion. Dissimilar to future acoustic Young readings, "On the Way Home" is featured here in its original full band guise.Stills and Furay so in tune that they sound like relatives, a soundboard I'm sure would reveal many detailed vocal delights. Without missing a beat Dewey Martin pounds out the rattling drum introduction to "Good Time Boy", in which he also takes the lead vocals. "Good Time Boy" thumps its heavy foot on the wooden gym floor with reckless abandon, as Young dressed as a hippie superhero swoops in and roars into a scintillating and cacophonous guitar solo. Stills soon joins in and their guitars intertwine like a DNA helix, joining in a sympathetic dance. The intensity translates well to the recording. The tune finishes on a rich note of feedback, as screams from the audience can be heard trickling in. The crowd is actually screaming for the band to turn down! Young can be heard making a comment that the band have been, "bad boys and will turn down a bit". I chuckle to myself, reflecting on the assault I just heard. The group then begins to bring it down a bit preparing for "Nowadays Clancy Can't Even Sing". "Clancy" is perfect, the guitars of Stills and Young waltz their way across the stage bedazzled in day glo paint. Furay and Stills joint vocals bring to mind the beautiful harmonies to come in both of their future endeavors with Poco and Crosby, Stills and Nash. The band is quiet enough that everything reveals itself in perfect clarity, and the group plays a special rendition of the Young classic. Introduced by Neil as the 'highlight" of the evening the band achieves lift off with the revolving and creative feedback filled "Mr. Soul". Superlatives do not do this performance justice, because as soon as the song begins, streaking and wobbly guitar filigree fireworks, fizzle and disappear across the agitated rhythm. The song is a punky movement, with its timeless guitar breakdown a tasty taffy stretched solo dressed in glowing vibrato. Epitomizing the 'classic' Neil Young sound that would be revealed on his upcoming debut solo LP, Young seizes the moment with cutting melodic ideas. "Mr. Soul" is short and sweet, but energized, and a definite highlight of the show. In a display of their originality and virtuosic diversity, the band follows the "Mr. Soul" bombardment, with a front porch and iced tea reading of 'A Child's Claim to Fame". What can be heard of the Stills and Furay vocals are clean and in perfect harmony. Neil lays some "Johnny Cash" chugging counterpoints on his hollow bodied Gretsch guitar, that wobble like a spinning top. A personal favorite, a forever melody, and one of the Springfield's best. After a semi serious warning about smoking in the arena from Neil the band prepares to answer the numerous yelled requests for "For What It's Worth", by playing it. A textbook rendition of at that point the band's biggest hit is sung nice and bluesy by Stephen. The recording gear sounds like it has been moved in front of Neil's stack because his work on the song is perfectly audible and a joy to hear. The crowd is obviously very satisfied with the chunky performance, and lets the band hear it. Before starting the last song of the evening, or at least of the recording, there is some funny interplay between the stage and the crowd. Inaudible shouts from the crowd about locating a piano are answered by Stills, with a "I spent all my money on a Bentley and my Marshall!". A fluttering "Bluebird" flaps its wings emphatically for nine minutes teetering on the edge of "raga rock" for its solo excursions. Neil and Stephen express their own style of "weaving" guitars as they journey through the many changes in "Bluebird's" flight. The relationship between Stills and Young's guitars counterpoints the perfect mix of Furay and Stills vocals, the blends equaling a euphoric and intense rendition. Stills slinky guitar glissades across the rock solid foundation built by the rest of the group like a psychedelic surfer. After Stills showcases his abilities, Young follows close behind with a gnarled and prickly feedback note that introduces his fuzzy solo spot. Together, Stills and Young stir the musical pot into a swirling maelstrom of crunchy guitars that eventually peaks falling back into the verse at a somewhat slower tempo then before. Martin and Messina chug along sympathetically, the foundation for these flashing excursions. The song comes to a mind expanding conclusion amongst a shower of colored rain feedback and electronic mice scurrying across the stage. This concluding version of "Bluebird" is a shining example of how good "Buffalo Springfield" were at the peak of their existence. What a slamming close to a short but sweet concert performance. 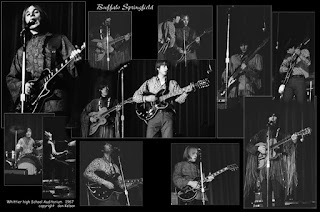 This field recording finds the "Buffalo Springfield" close to splintering into the factions that would soon change the face of rock and roll. 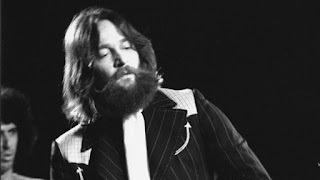 In a very short time Young would be preparing his first solo album, Furay would be pioneering country rock with his band "Poco", and Stills would become a founding member of Crosby Stills and Nash. A comet streaking across the night sky, their life as a band was short lived, but their influence would continue to be felt right up to today. The "Springfield" were a band of headstrong, overly talented young men who were feeling their way across a ever changing musical landscape while facing skyrocketing popularity Unaware of their influence while they were living it, this performance is a period snapshot of their talents and musical powers for those unable to witness it firsthand. Lovers of rock must consider themselves lucky that something as rare and special as a live performance by the band still exists today, and we are able to dive into it when the spirit moves us.